Every year it’s the same. Every year it’s different. 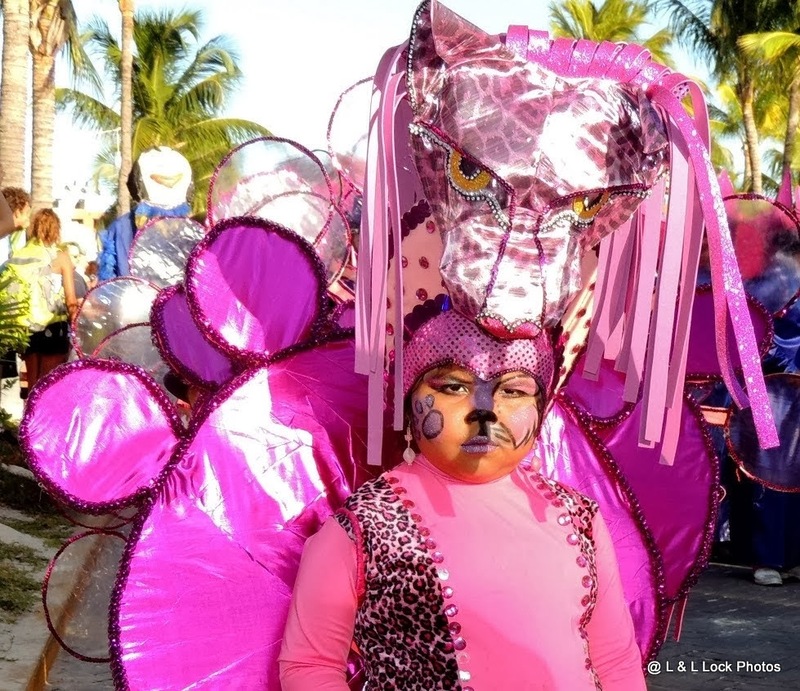 Carnaval; it’s a chaos of colourful costumes, confusion, and crazy-loud music. Thumpa! Thumpa! Thumpa! 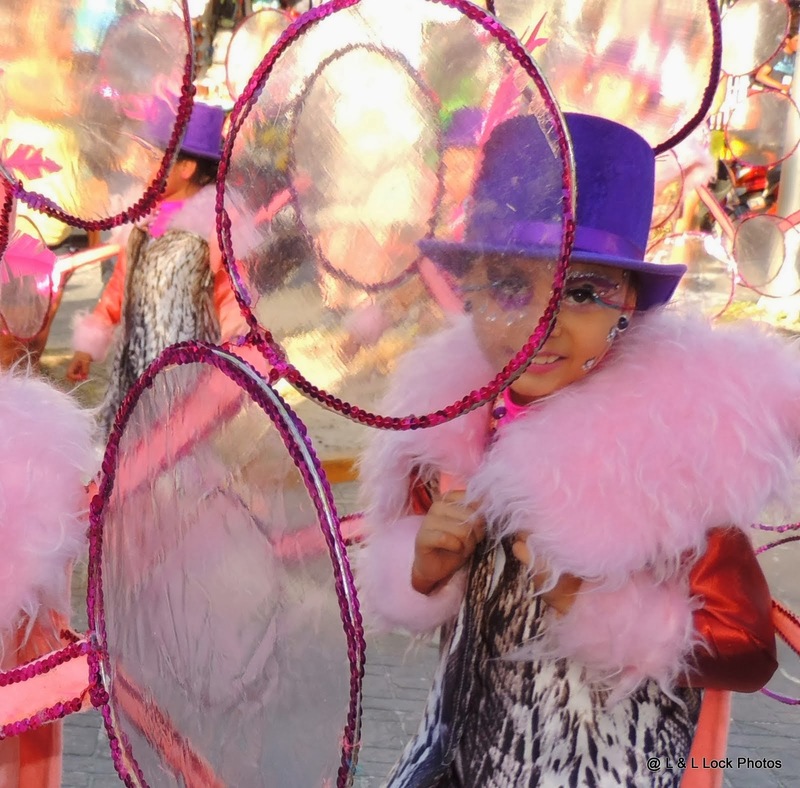 For the five days leading up to the forty days of Lent, the island reverberates with fun. The schedule of events normally begins with the Coronation Dance on the Friday night. It includes the crowning of kings and queens from various age segments, and finally the crowning of the official carnival king and queen. In previous years there have been two parades on consecutive days both starting at three in the afternoon, give or take an hour or two. For the Programa 2011 the parades were on Saturday and Sunday as they were in most other years. However, this year 2014, the two parades were moved to Sunday and Monday. 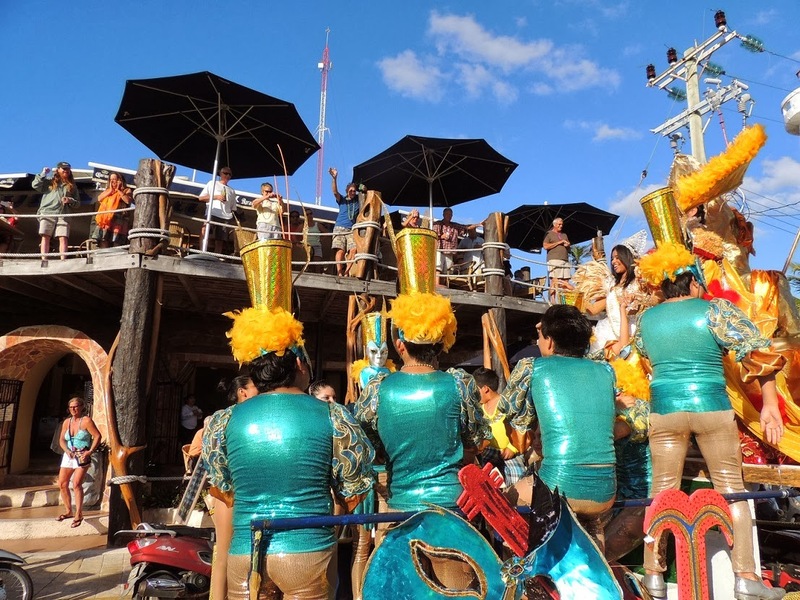 Just as the waiter placed our cold beverages in front of us, the official Carnaval king and queen and their dance troupe came by! Obviously the parade wasn’t over. It was just starting. Recklessly scrambling down the asymmetrical stairs at the restaurant, I inserted myself into the crowds, hoping for a few good photographs. 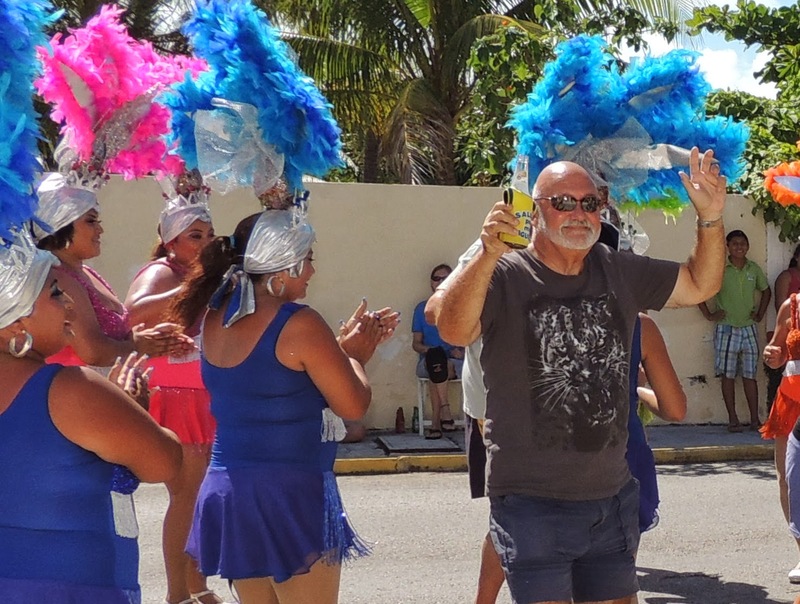 For the next hour several groups danced past, flashing feathers and flounces, gyrating north along Medina Avenue from the naval base towards the Auxles Hotel. Again, another change. Normally the groups congregate at the north end and head south towards the naval base. Perhaps the Carnaval organizers wanted to shake things up a bit just to see if anyone would notice. Slipping in and out of the crowd as I snapped photos I recognized a number of the participants. One very hard working woman, possibly the owner of a local dance studio, annually leads her large troupe of dancers ranging in age from five to adults. She cajoles, encourages, and entreats the dancers to stay in line, keep moving, stay focused, and most importantly – smile. I am in awe of her patience and talent. The costumes for this group were outstanding as always; confections of fur, feathers, pink and blue gauzy fabrics, sequins and face paint. Her theme this year was jungle cats, big cats, cute and snarly cats. Standing on the street and looking back up to the upper deck at Jax Bar & Grill, I noticed one of the patrons tossing multiple strings of Mardi Gras-type beads to the groups below. 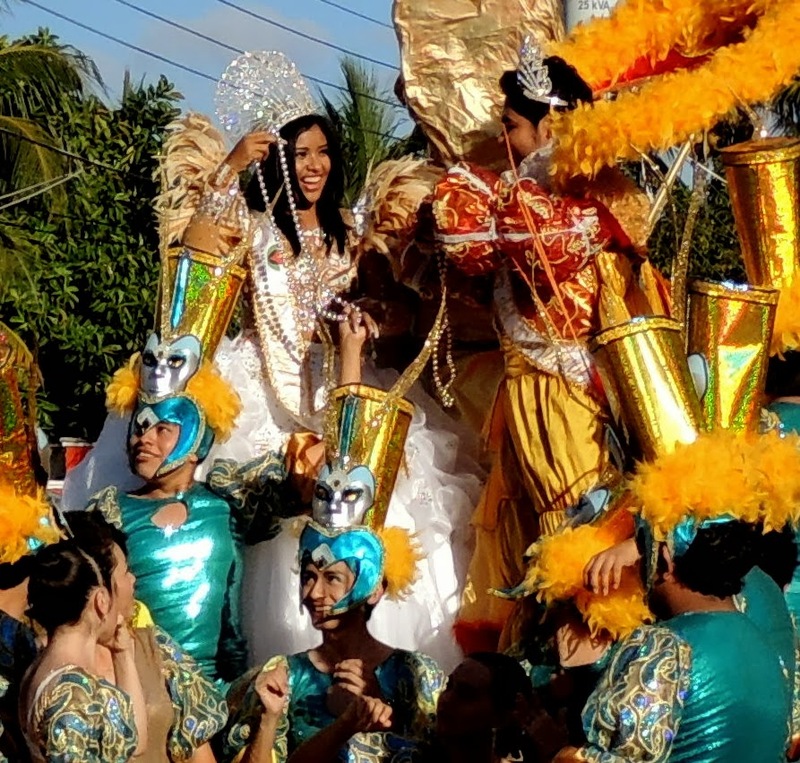 A look of delight brightened the face of the Carnaval queen as she caught one of the flying strands, happily displaying her colourful trophy to the group. The man tossing the beads lives part-time on Isla Mujeres, but his primarily residence is in New Orleans. He wanted to inject a bit of Mardi Gras fun into the event, promising to bring more sparkling beads for next year’s parade. Amongst the other dance troupes this year were several friends: Yadira Velázquez Medina, Jeannie Poot Hau, Bonnie Hamilton and Alexis Graboskie. 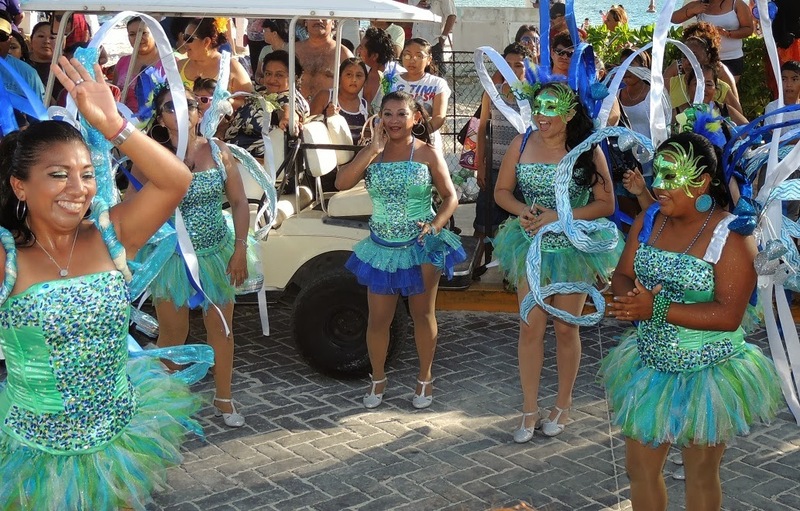 They have had a very strenuous schedule in the months leading up to carnival with dance practice most nights of the week, and then four days of dancing in parades, on street corners and at the official events. One troupe of dancers did a special appearance at Richard and Linda Grierson’s Casa Luna Turquesa. After a few technical difficulties (someone had misplaced the USB that held their dance music) their enthusiastic presentation got underway. In front of Casa Luna Turquesa on Aeropuerto Rd. The ladies did a spectacular job in the hot afternoon sun. It was a bit of impromptu fun for the neighbourhood. After a refreshing cold drink or two they proceeded on to the next location, Brook Prinsen and Paul Ricker’s house, Cas-a-Beer, for more dancing. 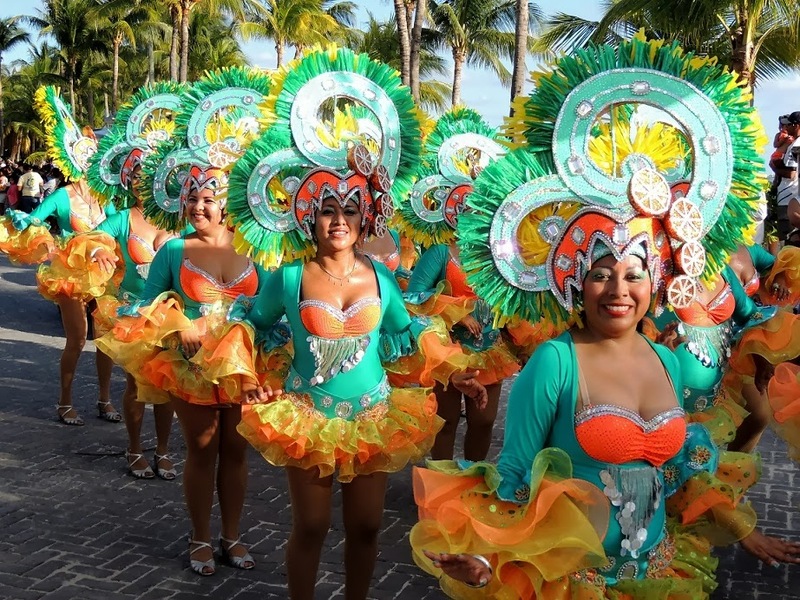 These extras dances are how the participants earn money to pay for their elaborate costumes. The hat, or bucket, or box is passed around through the crowd. Dig deep folks, and help them out! Carnaval just wouldn’t be carnaval without the various dance troupes. 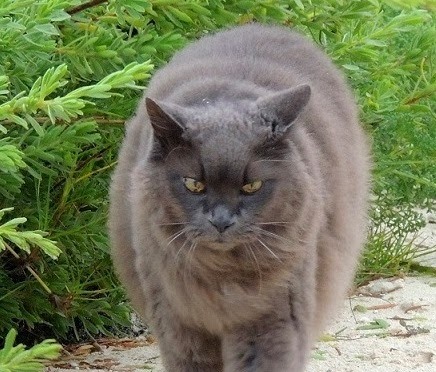 I realized his cat costume and annoyed expression perfectly matched my fifteen-year-old cat’s expression when he is annoyed. When the youngster is older he might find the whole parade-thing amusing, but on that day he was not pleased. But now everything is finished, the fun, the festivities, and the crazy music. 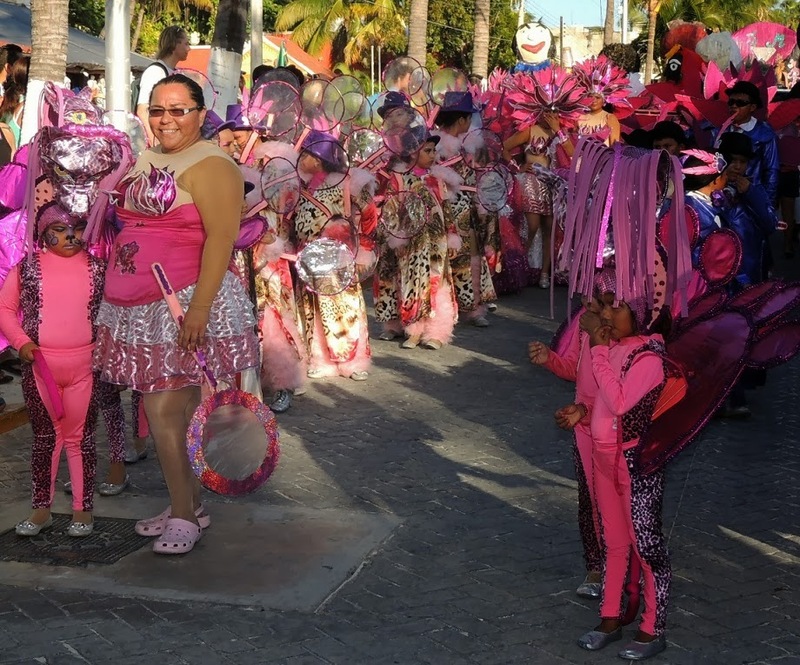 Only eleven more months until the next Carnaval – February 11th to 17th in 2015. It’s the same, and it’s different. Similar events, different dates. Similar groups, different costumes, and possibly different parade dates, times and routes! Great post and beautiful photos Lynda! Thanks for sharing Carnaval with us. I seem to remember that “I'm not having fun” look from my son. Too funny! Another wonderful blog post, Lynda! I have been on the island a few times for Carnival & love it! Actually extended our vacation next year so we will be there! Thanks for friending me on Facebook! Thank you, Lynda! We're May/June visitors, so intrigued by happenings at other times of the year. Once again you bring charm to the island we are all so fund of in your writing. Thanks for the great pics and entertaining story. I have been to Isla almost every month of a year but never during carnival. I need to add that to my “bucket list”. Next PostNext Taking a holiday for two weeks!